Historians tell us that tattoos have been around for over 3,000 years. We know this is true as we have seen the evidence from the mummified remains of many ancient cultures, such as Egyptian, Japanese and Mongolian. But in more recent ages, there is little evidence of much tattooing in the western world prior to the nineteenth century. This was mainly because of the Roman and Greek Empires – as well as the Catholic Church – who effectively banned its citizens from inking tattoos on their bodies. In fact, it was not until the 18th Century when western explorers started circumnavigating the world, that they discovered far-flung lands where the practice of tattooing was still alive and flourishing. This led to many of these globetrotting sailors, and even some of the military who were colonizing new worlds, returning home with tattoos they had come across on their travels. A sort of ‘mariner tattoo code’ developed whereby certain tattoo symbols had special meanings to fellow sailors. For example, a sailor with a swallow tattoo would indicate he had traveled over 5,000 miles; and a shell back turtle tattoo indicated that the wearer had crossed the equator. There followed a popular nautical tattoo culture which spawned such designs as anchors, flags, mermaids, and later, the pin-up girls popularized by Norman Collins, aka “Sailor Jerry”, who set up one of the world’s first tattoo parlors in Hawaii in the South Pacific. But tattooing in the modern era didn`t really catch-on until Samuel O`Reilly invented the Electric Tattoo Machine in 1890. This was further refined into the first “Coil and tube” Machine in 1904, which amazingly, is almost identical to the tattoo machine still used today. Prior to this invention, tattoos were applied using the ‘stick and poke’ method, which involved using a sharp stick and a pot of ink. This was a long, arduous, and very painful process; but once the quicker and less painful electric tattoo machine came into use, it opened up tattooing to the world at large. 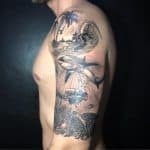 Not only was it less painful and quicker, but it also enabled the tattoo artists to create much finer and intricate details in their tattoo designs. At the turn of the 20th century, tattooing was still largely confined to the under classes – criminals, circus performers, and sailors, but during the next 20 years, a few brave souls started to dabble with tattoos, with designs such as anchors, crosses, and regimental seals being inked on their bodies. During the Depression years of the 1930s, tattoos started to become more commonplace. One idiosyncrasy of the times led to many people tattooing their social security numbers on their arms, and even their blood groups. Some people even went further and embellished their social security number with a patriotic symbol, such as an American flag or an eagle. Others, seeking food and shelter during the depression, had elaborate tattoos inked on their bodies in an effort to obtain work in a circus. But the ‘genie was out of the bottle’, and people with multiple tattoos were no longer regarded as circus freaks. It was during this time that people – mainly ex Mariners – started setting up shop as tattoo artists. Many of these worked on tattoos in their living rooms or parlors – hence the name “tattoo parlor”. Other popular tattoos during the 1930s were comic strip characters, film stars, and rudimentary representations of historical events. As mentioned above, the 1940s and the Second World War brought us the “Sailor Jerry” tattoos along with many colorful crude designs, such as heart-wrapped ‘mom’ tattoos, Hula Girls, palm trees and military emblems. A well-known example of Sailor Jerry`s pin-up work was a scantily clad girl in a martini glass holding a deck of cards with the words “man`s ruin” written above her dangling leg. The 1950s saw a return to more conservative values which meant there were fewer tattoos amongst the general population. But there was a further adoption of ‘anti-establishment’ tattoos amongst the underclasses. In particular, tattoos became the preserve of prison inmates, ex-cons, bikers, gang members, and so on. The 1960s heralded a retrograde step in the American tattoo industry when unhygienic tattooing practices led to a major outbreak of hepatitis B, resulting in New York City and many other parts of the USA introducing tattoo bans. However, this didn`t stop the younger generation adopting tattoos. It was the age of flower power and peace-loving hippies. Youths representing the civil rights movement, the anti-Vietnam war movement, and women`s protest movements embraced the tattoo culture. The singer Janis Joplin popularized tattoos during this time with a Florentine bracelet tattoo on her wrist. This was copied by thousands of people. During the 1970s, tattoos were starting to be accepted by the mainstream population. 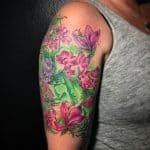 They became symbols for personal expression and a new generation of tattoo artists with backgrounds in fine arts meant that tattoo designs became much more intricate. It is in this decade that we saw the start of full sleeve and whole body tattoos. It was also the decade when more female tattoo artists started to establish themselves. This meant there was also a much greater diversity in designs. The 1980s introduced a tattoo style known as black work. This became very popular. Bold tattoos with geometric designs such as the Celtic knot became the order of the day. It was also the decade of appearance-changing plastic surgery. Tattoos became popular, along with startling hair colors and outlandish clothes fashions. The 1980s also saw the rise of MTV and other mass media outlets with the singers and celebrities starting to influence trends with their latest tattoos. It`s back to the beginning in the 1990s, with tribal designs from the Polynesian and Japanese cultures becoming the “in” thing, along with dolphins, suns, moons and the stars. The 1990s is the decade when women actually accounted for more tattoos inked in the USA than men. So we start to see tattoos inked to create permanent eyeliner and lipstick, as well as more feminine designs, such as butterflies and hearts. Female cancer survivors also start to use tattoos to cover mastectomy scars. The 2000s saw the explosion of reality tattoo TV shows such as “Miami Ink”, which helped to bring tattooing well and truly into the mainstream. A clutch of lower back tattoos started to spring up as well as the growth of the celebrity tattoo culture, with pop stars such as Madonna and Rihanna leading the way. 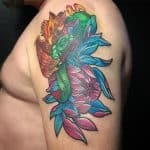 During the current decade, we have seen a significant improvement in safe tattoo practices along with the development of hygienic, hi-tech state of the art tattoo studios – such as we have at ALL DAY Tattoo in Bangkok. More and more people are now taking the plunge for the first time, including many in their 40s, 50s, and 60s who missed the ‘tattoo-boat’ the first time around. 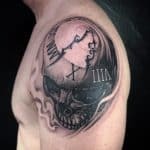 During the last seven years, tattoos have become totally mainstream, and tattoos are increasingly accepted by most employers. These days it’s all about where on your body can you place your latest tattoo? Nowhere is out of bounds, including your fingers, inside your finger nails, the inside of your lips and your more private parts. In fact, the decade we are living in now is the greatest time to be alive as far as tattoos are concerned. Now you can choose from virtually any style that has been popular down the years. It is also the decade that has seen the launch of ALL DAY Tattoo In Bangkok – Asia`s premier Tattoo Studio. So where better to indulge in your tattoo fantasies than at ALL Day Tattoo in Bangkok? 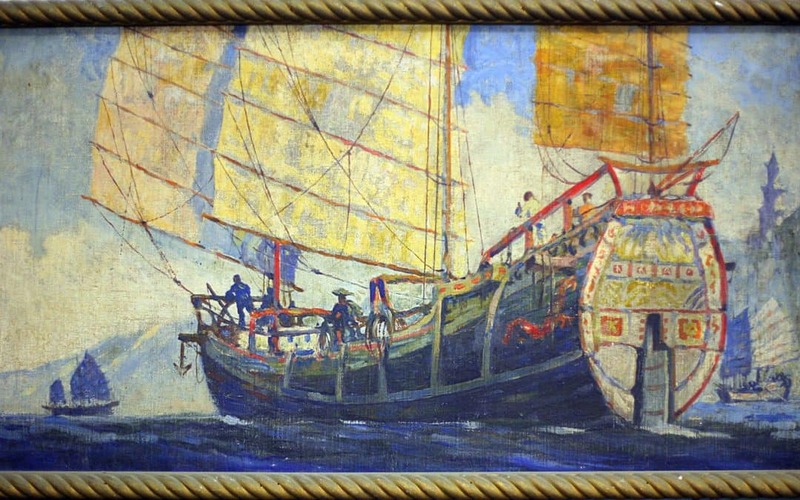 Here, we have an eclectic mix of renowned international artists who can help you decide on your design and placement. If you contact us below we can arrange your free consultation – with absolutely no obligation to use our studio services. Come and chat to us and discuss your ideas and dreams for your first – or indeed your latest – tattoo.